Bluewater Lake: Christopher Duran caught and released a 34-inch tiger muskie on his first cast Oct. 14. He was fishing from shore and using a triple jointed shad swim bait. Dennis Chavez Lake: Rufino Gonzalez of Clovis caught a 28-inch, 10-pound, channel catfish Oct. 13. He was using hot dogs. Pecos River: Anthony Gallegos of Santa Fe caught a 22-inch rainbow trout Oct. 13. He was using an olive-green Pistol Pete. Navajo Lake: Christian Gladfelter of Albuquerque caught and released a 5.34-pound smallmouth bass Oct. 14. He was using a ½-ounce jig. Sara Weber of Niwot, Colorado caught and released her very first northern pike. She was fishing near Eul Canyon and using a crank bait. Chris Sanchez of Albuquerque caught and released a 5.03-pound smallmouth bass Oct. 14. He was using a jerk bait. 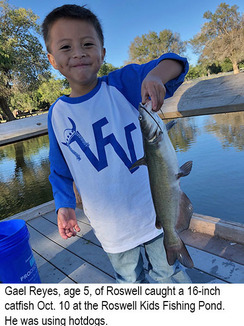 Roswell Kids Fishing Pond: Gael Reyes, age 5, of Roswell caught a 16-inch catfish Oct. 10. He was using hotdogs. 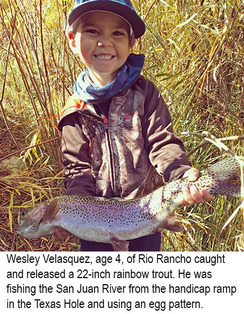 San Juan River: Wesley Velasquez, age 4, of Rio Rancho caught and released a 22-inch rainbow trout Oct. 13. He was fishing from the handicap ramp in the Texas Hole and using an egg pattern. His dad helped him cast, but he did all the rest. Tingley Beach: Amaris Hidalgo, age 4, of Los Lunas caught a 19-inch catfish Oct. 5. She was using hot dogs. 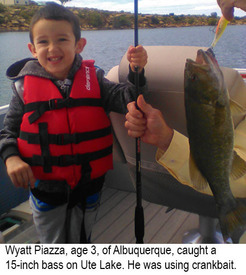 Ute Lake: Wyatt Piazza, age 3, of Albuquerque, caught a 15-inch bass Oct. 8. He was using crankbait. Cimarron River: Stream flow near the town of Cimarron on Monday morning was 22.2 cfs. Fishing was good using small streamers, copper John Barrs, San Juan worms, Fire Balls and worms for trout. Fishing at the Gravel Pit Lakes was fair to good using PowerBait and Fire Balls for trout. 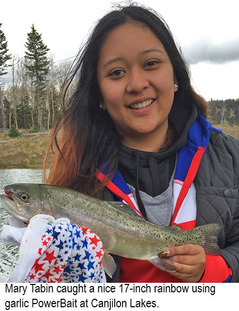 Clayton Lake: Fishing for trout was slow with just a few caught by anglers using PowerBait. We had no reports on other species. Fishing pressure continued to be very light. Conchas Lake: Fishing was fair to good using jigs, creature baits, worms and tubes for largemouth bass and smallmouth bass. Fishing was good using homemade dough baits, shrimp, cut bait and chicken liver for catfish. We had no reports on other species. The surface water temp was in the mid 60s. Costilla Creek: Stream flow on Monday morning below Costilla Dam was .38 cfs. Mark your calendar to check this one out next spring. Eagle Nest Lake: Fishing was good using worms, PowerBait, spinners and small jigs for perch. Fishing was good using worms, PowerBait, Fire Balls, Pistol Petes and spinners for rainbow trout. Kokanee snagging was slow. We had no reports on other species. Eagle Rock Lake: Fishing was very good using PowerBait, Fire Balls, wooly buggers, Panther Martins and Pistol Petes for trout. Gallinas River: Fishing was fair using red copper John Barrs, Fire Balls and worms for trout. Lake Maloya: Fishing was fair to good using Pistol Petes, spinners, PowerBait and salmon eggs for trout. Monastery Lake: Fishing was good using Pistol Petes, wooly buggers, PowerBait and salmon eggs for trout. Pecos River: Stream flow near the town of Pecos on Monday morning was 32.6 cfs. Fishing was slow to fair using beef liver and shrimp for catfish. We had no reports on other species. Red River: Stream flow below the hatchery on Monday morning was 45.2 cfs. Trout fishing was good using poundmeisters, wooly buggers, Fire Balls, PowerBait and worms. Fishing at the hatchery pond was good using PowerBait and worms. Rio Grande: Stream flow on Monday morning at the Taos Junction Bridge was 171 cfs. Trout fishing was good using black and olive wooly buggers, bead head hare’s ears, copper John Barrs, Panther Martins, PowerBait and night crawlers. We had no reports on other species. Rio Hondo: Stream flow on Monday morning near Valdez was 13.6 cfs. We had no reports from anglers this week. Rio Mora: Stream flow near Terrero on Monday morning was 9.38 cfs. We had no reports from anglers this week. Rio Pueblo: Stream flow near Penasco on Monday morning was 9.79 cfs. Fishing was good using copper John Barrs and salmon eggs for trout. Storrie Lake: Fishing was good using Velveeta cheese and PowerBait for trout. A few were also caught by anglers using salmon eggs. We had no reports on other species. Ute Lake: Fishing was good using shrimp, cut bait, blood bait and chicken liver for catfish. Fishing was fair using crank baits, senkos, drop shot rigs and tubes for largemouth bass and smallmouth bass. Fishing was fair using minnows, spoons and grubs for walleye. Fishing was fair using slab spoons and blade baits at 35 to 40 feet for white bass. The surface water temp was in the mid 60s. Abiquiu Lake: The lake level remains low and anglers should use extreme caution when launching boats. Four-wheel drive vehicles are recommended for launching. Much safer launching would be with canoes or kayaks. A few walleye were caught by anglers using crank baits, spoons and worm harness rigs. We had no reports on other species. Animas River: Water flow below Aztec on Monday morning was 194 cfs. Trout fishing was fair to good using copper John Barrs, San Juan worms and salmon eggs. Bluewater Lake: Fishing was fair to good using hot dogs, swim baits and crank baits for tiger muskie. We had no reports on other species. Canjilon Lakes: Trout fishing was fair to good using PowerBait, worms, Fire Balls, Panther Martins, bead-head nymphs and Pistol Petes. Mary Tabin caught a nice 17-inch rainbow using garlic PowerBait and Andrew Leyba of Rio Rancho reported catching a 17, 18 and 19-inch rainbow. He was using a gold bead nymph behind a clear bubble. Craig Scargall of Santa Fe caught his first Rio Grande Cutthroat trout here last week while using a Panther Martin. It measured 17-inches. Chama River: Monday morning flows below El Vado and Abiquiu were 144 cfs and 350 cfs respectively. Trout fishing below El Vado was good using wooly buggers, Pistol Petes, copper John Barrs, elk hair caddis, micro mays, night crawlers and PowerBait for brown and rainbow trout up to 18 inches. Fishing was good using worms, copper John Barrs and wooly buggers for perch and bass. Fishing below Abiquiu was fair to good using wooly buggers and night crawlers for trout. Kokanee snagging season opened Oct. 1 from El Vado Lake to the western boundary of the Rio Chama Wildlife Management Area, but we had no reports from anglers. Cochiti Lake: Fishing was slow to fair using worms and minnows for a mixed bag of crappie and white bass. Fishing was slow to fair using crank baits, jigs and creature baits for smallmouth bass and largemouth bass. Fishing for all other species was slow. El Vado Lake: Fishing was fair using worms and grubs for perch and smallmouth bass. Kokanee snagging was slow. We had no reports on other species. Fenton Lake: Fishing was good using Pistol Petes, wooly buggers, leeches, worms, Fire Balls and PowerBait for trout. Heron Lake: Fishing was slow for all species. Fishing pressure was extremely light. Jemez Waters: Stream flow on the Jemez near the town of Jemez on Monday morning was 18.5 cfs. Trout fishing on the Jemez, East Fork, San Antonio and Cebolla was good using copper John Barrs, terrestrials, elk hair caddis, Fire Balls and worms for brown and rainbow trout. Laguna del Campo: Fishing was fair using PowerBait for trout. Fishing pressure was light. Manzano Lake: Fishing was fair using garlic scented PowerBait and salmon eggs for trout. We had no reports on other species. Navajo Lake: HOT SPOT FOR SMALLMOUTH BASS: Fishing was excellent using jerk baits, jigs, crank baits, senkos, tubes, worms and swim baits for smallmouth bass. Bass anglers also reported catching several largemouth bass. Fishing was very good using spinnerbaits, jerk baits, swim baits, crank baits and jigs for northern pike. We had no reports on other species. Designated no-wake areas are closed from Oct. 1 through Nov. 8. San Juan River: Stream flow below Navajo Lake on Monday morning was 570 cfs and has been scheduled to be reduced to 500 cfs at 3:30 PM. Fishing was good using red annelids, egg patterns, Griffiths gnats, fore and afts, zebra midges, midge clusters, crystal flash emergers and dead chickens for brown and rainbow trout. Through the bait waters, trout fishing was good using San Juan worms, copper John Barrs, emergers, egg patterns, worms and salmon eggs. Seven Springs Brood Pond: Fishing was good using PowerBait, salmon eggs and worms for trout. Tingley Beach: Fishing was slow with just a few catfish reports from anglers using hot dogs and homemade dough baits. Alumni Pond: Fishing continued to be slow for all species. Bear Canyon Lake: Fishing was good using worms and liver for small catfish. We had no reports on other species. Caballo Lake: Fishing was fair using chicken liver, blood bait and homemade dough bait for catfish. We had no reports on other species. Elephant Butte Lake: Fishing was fair to good using sassy shad, spoons, curly tail grubs and blade baits for white bass. Fishing was fair to good using crank baits, tubes, creature baits, senkos, swim baits and spinnerbaits for largemouth bass and smallmouth bass. Fishing was good using chicken liver, minnows, homemade dough bait and cut bait for catfish. We had no reports on other species. Gila River: Stream flow on Monday morning was 86.3 cfs. Fishing was fair to good using liver and worms for catfish. Fishing was good using wooly buggers and worms for smallmouth bass. We had no reports on other species. Lake Roberts: Fishing was good using crank baits and spinnerbaits for largemouth bass. Fishing was slow to fair using salmon eggs and PowerBait for trout. We had no reports on other species. Percha Dam: Fishing was slow for all species. Tony Cardella reported that he and his wife fished here over the weekend and saw no less than 100 carp in one of the deeper holes remaining since the flow was cut off. They did not catch any of them. Rio Grande: Stream flow below Elephant Butte Monday morning was 0.00 cfs. Fishing in the Mesilla Valley Dam area was fair to good using chicken liver and homemade dough bait for channel catfish. We had no other reports. Snow Lake: Fishing was good using PowerBait for rainbow trout. Alto Lake: Fishing was fair to good using worms for catfish. Fishing was fair using PowerBait, worms and salmon eggs for trout. We had no reports on other species. Black River: Stream flow at Malaga on Monday morning was 13.4 cfs. Fishing was slow to fair using chicken liver and worms for catfish. We had no reports on other species. Blue Hole Park Pond: Fishing was slow to fair using PowerBait and Fire Balls for trout. We had no reports on other species. Brantley Lake: Fishing was good using swim baits, senkos, plastic worms and jigs for largemouth bass and white bass. Fishing was good using liver and worms for catfish. We had no reports on other species. Carlsbad Municipal Lake: Fishing was slow for all species. El Rito Creek: Fishing was good using PowerBait, Fire Balls, worms and nymphs under a bubble for trout. Grindstone Reservoir: Fishing was good using PowerBait, worms and Fire Balls for trout. We had no reports on other species. Oasis Park Lake: Fishing remained slow for all species. Pecos River: Stream flow below Sumner Lake on Monday morning was 26.6 cfs. We had no reports from anglers this week. Ruidoso River: Stream flow on Monday morning at Hollywood was 7.97 cfs. Fishing was good using salmon eggs for trout. Santa Rosa Lake: Fishing was slow for all species with just a few bass caught by anglers using jigs. The water was quite murky, and the surface temp was in the low to mid 60s.